METHODS: Following IRB approval, a single institution’s resident physicians entering their internship year were assigned instructional videos to watch on the topics of ACLS, supplemental oxygen delivery, bedside trans-thoracic echocardiography, and invasive line placement. They then participated in a 3-day hands-on simulation curriculum throughout which they physically performed the skills described in the videos. We surveyed residents on their confidence in performing across three areas: Procedures, Autonomy, and Medical Knowledge. We compared their post-simulation confidence in both procedural ability and knowledge base to their pre-simulation confidence levels as well as to residents (PGY-2) at the same institution who had just completed their internship and had not undergone any formal instruction or simulation. RESULTS: Overall confidence levels (summary of all survey areas) of interns increased from the pre-survey to the post-survey (p=0.042), as well as specifically for Procedures (p=0.048) and Autonomy (p=0.021). 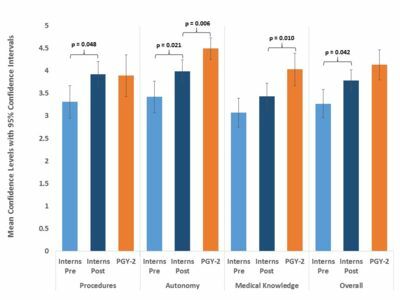 After the 3-day simulation curriculum, there were no significant differences in confidence between interns (following simulation) and PGY-2 residents on overall confidence (p=0.069) and in Procedures (p=0.876). However, interns’ confidence was still lower than that of the PGY-2s in Autonomy (p=0.006) and Medical Knowledge (p=0.010). CONCLUSIONS: Prior to this simulation based curriculum, new interns received cursory training in ACLS, line placement, and supplemental oxygen delivery techniques – skills that are essential to house-staff who are often the first-call for both routine and emergency situations. These knowledge deficits created wide variability in the skill-set of anesthesiology interns resulting in variations in patient care and safety concerns. A simulation-based curriculum utilizing a flipped-classroom model during intern orientation can contribute to a standardized and effective skill-set delivered in a short period, yielding an comparable confidence in implementation of that skill-set, particularly in procedural ability, as one-year of residency. Figure 1. Mean confidence levels pre- and post-simulation for PGY-1 residents and for PGY-2 residents who had not undergone simulation, for overall confidence and for each area. Error bars indicate 95% confidence intervals. P-values are reported for statistically significant differences (p < 0.05).